The key to training your dog to do this, or anything else, is consistency. Once you start their training, you must keep up with it, even when it’s a hassle. Dogs are creatures of habit, make good training a part of your dogs habits. Skills needed already: Sit and Stay commands. The first step to getting your dog to greet visitors calmly is to get your dog to greet you, and all other family members, calmly when you come home. When you come in the door, make your dog sit and stay before you give them any attention, besides the commands. Some people use a rug, or mat near the door for the dog to sit on. Some don’t. Once the dog is sitting calmly, give a [amazon_textlink asin=’B01KPSJBG0′ text=’high-value treat’ template=’ProductLink’ store=’fosterpack-20′ marketplace=’US’ link_id=’409d6d9b-4cc4-11e8-b4ee-c5727cfa9f82′] and some love. Practice makes perfect, so keep working with them. Keep going out and coming back in, over and over again. Practice daily for the first few days, if possible. Once they get good at it, with every member of the family, you can do away with the treats, and just give attention. I’ve found that most dogs simply learn faster when there is food involved. Remember, consistency is key. Everyone must do it, every time they come in the door until it becomes a habit for the dog. Once they are nearly perfect when it’s family members coming in, it’s time to introduce visitors. Starting with one visitor is best. Find a friend or outside family member who doesn’t mind working with you for the first few sessions if possible. I often ask my nieces and nephews to help out with this task. Obviously, your dog must be child-friendly to use kids as guinea pigs. Have your helper ring the doorbell or knock on the door. As soon as your dog is alerted to the fact that someone is at the door, have them sit and stay, as you would when you come in the door. Do not open the door until your dog is sitting calmly! No matter how long it takes. Once they are sitting calmly, I offer a [amazon_textlink asin=’B01KPSJBHO’ text=’high-value treat’ template=’ProductLink’ store=’fosterpack-20′ marketplace=’US’ link_id=’b9310b41-4cc4-11e8-a789-9f31c141fc06′], before opening the door. Next, open the door and allow your helper to enter. If your dog remains in the sit, stay position, reward them. Then allow your visitor to greet them, talking calmly and/or petting. Allowing your dog to get his sniffing in, of course. Do not release him from the sit/stay until your visitor is in and comfortable. 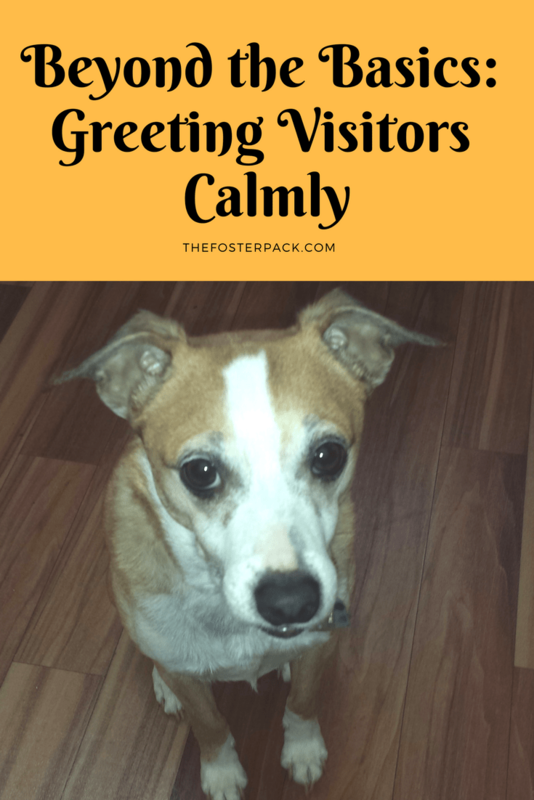 Again, keep practicing to greet visitors calmly, as often as possible, and with different visitors. You’ll be surprised at how fast most dogs will learn if you keep things consistent. I prefer to work with my dogs one on one at first, bringing more dogs into the mix as each one learns how to greet visitors calmly. I also use an [amazon_textlink asin=’B00068R98C’ text=’ultra-sonic bark control,’ template=’ProductLink’ store=’fosterpack-20′ marketplace=’US’ link_id=’8c6a70b8-4492-11e8-839f-b5e9b1f837f6′] to help keep the other dogs that are put away quiet, although a quiet command works well too.